Retirement is something most of us look forward to − particularly on a Monday morning. However, those thoughts are often little more than a whimsical cocktail of not having to work and prolonged holidays. The reality could be rather different, particularly if your retirement date is some way off. For a start, retirement is now often not the sudden change from work to enforced idleness that it used to be. It has increasingly become a gradual process, with part-time work playing an important role. The latest data from the Office for National Statistics (ONS) show that 13.4% of men and 7.9% of women aged 65 and over are still in employment. The blurring of the work/retirement boundary is being accompanied by changes to the state pension age (SPA). The process of equalising SPA for men and women started in 2010, and the first stage has now ended, with both sexes sharing a common SPA of 65 in November 2018. However a further increase is underway, with others planned for the future. Life expectancies have increased significantly over recent years so your plans for saving should anticipate a longer retirement than you may have expected. At the rate SPA is rising you may need to have reached age 70 by around 2050 before you can start to draw your state pension – food for thought if you were born after 1979. The rise in SPA reflects some good news for retirees: the increase in life expectancies. 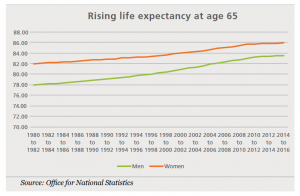 Between 1980−82 and 2015−17 the average life expectancy in the UK at age 65 had risen by over five and a half years for men (to 83.5 years) and just over four years for women (to 85.9 years), with most of this improvement occurring before the start of the current decade. These are average numbers based on historical data, so they don’t tell the whole story. Other calculations made by the ONS suggest that a man aged 65 today has a one-in-four chance of reaching age 94, while a woman of the same age has the same odds of reaching age 96. Today’s pension offerings are best considered in two parts: state provision and private provision. These remain complementary elements, with the state providing a base/subsistence level of income on which private provision is built. The state’s role in retirement provision is shrinking. For example, there is now no earnings-related link to state pensions, other than in terms of the eligibility The subtext is to limit the burden of an ageing population on the Treasury. In parallel with the declining relevance of the state, there is greater emphasis on private pension provision and individual For example, the introduction of automatic enrolment and the increased flexibility in drawing benefits from pension arrangements. The state pension is now a single-tier arrangement, meaning that there is no longer any earnings-related element. In 2018/19, the theoretical maximum new state pension is £164.35 a week – about 60% of what the National Living Wage would provide for a 35-hour week. In practice, few people currently reaching their SPA receive this amount – many are receiving less and some more. The differences stem from the arcane transitional adjustments made to take account of the old state pension regimes, including the option to opt out (technically ‘contract out’) of the earnings-related element. Unlike the old state pension regime, the new state pension is a purely individual benefit and does not incorporate any widow’s or widower’s pension. However, some may arise under the transitional provisions in respect of national insurance contributions (NICs) made or credited before 6 April 2016. Once payment starts – and don’t forget that moving SPA – the state pension is currently due to increase by the greater of the rise in average earnings, price inflation (as measured by the consumer prices index) and 2.5%. Most experts believe this so-called ‘triple lock’ should be replaced, with the 2.5% floor, a costly guarantee, removed. For example, before the 2017 general election the House of Commons Work and Pensions Select Committee called for its abolition from 2020. The fragile state of UK politics means the triple lock is likely to survive until after the next election. If you are still working, you can opt to defer the state pension to increase the amount you receive when you start to take it. To find out your projected state pension entitlement, start by visiting www.gov.uk/check-state-pension. Then you will need to consider your private provision. Final salary pension schemes, often referred to as defined benefit schemes, generally offer a pension benefit related to your salary around the date of retirement and the number of years of service with the scheme’s sponsoring employer. In the private sector, the cost of running final salary schemes has prompted their widespread closure: as at 31 March 2017 only 12% of schemes were open to new members and 39% were no longer accruing further benefits for existing members. The public sector has continued to offer defined benefit pension schemes, which are largely funded on a pay-as-you-go basis, unlike their pre-funded private sector counterparts. Even so, these schemes have been subject to various cost-saving measures, such as higher member contributions and moving towards benefits based on career average earnings rather than final salary. If you are a member – past or present – of a defined benefit pension arrangement, you should probably consider yourself lucky. Do make sure you understand what your eventual benefits should be and seek expert advice before taking any action, such as transferring to another pension arrangement. At their simplest, defined contribution pensions, sometimes called money purchase pensions, are similar to savings plans. Contributions made by you, your employer (if you have one) or even third parties are invested in your chosen investment funds. When you want to draw benefits, you cash in part or all your fund, either buying a pension annuity or directly withdrawing the cash. 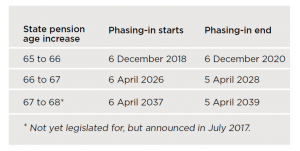 Reforms that took effect in April 2015 mean that there are virtually no restrictions on how you take your benefits, provided you have reached the minimum pension age (currently 55, but 57 from April 2028 and then increasing in line with SPA). Defined contribution pension arrangements take a variety of forms, from highly tailored individual plans, such as self- invested personal pensions (SIPPs), to large multi-employer arrangements, such as the government-established National Employment Savings Trust (NEST). 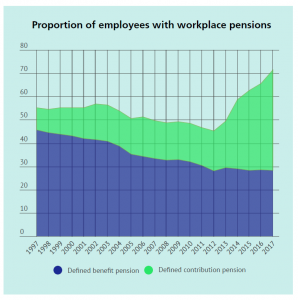 The growth of defined contribution schemes has been given a boost by auto-enrolment of employees for workplace pensions, as the graph below demonstrates. Auto-enrolment was phased in from October 2012 and is now fully in force. The first round of contribution increases took effect from 6 April 2018 and further significant increases to employer and employee contributions are due in April 2019. If you have been auto-enrolled into a pension in the past five years, the chances are you became a member of a defined contribution arrangement. Defined contribution pensions have largely replaced final salary schemes and allow you to cash in all or part of your fund as an annuity or cash withdrawal. Lifetime ISAs (LISAs) are not pension arrangements, but a variant on the individual savings account (ISA) that was launched in April 2017. Their structure looks like pensions because there is a form of tax relief on contributions and a minimum age of 60 for drawing out funds without penalty, unless the cash is used for purchase of a first home. In some circumstances, a LISA is preferable to a pension arrangement, but the choice is best made with advice. Contributions to private pensions generally attract full income tax relief, so if you are a higher rate taxpayer in England, Wales or Northern Ireland, a contribution of £100 will cost you a net £60 (it is £59 in Scotland where the higher rate on earnings is 41%). The income tax relief is so generous that there is a raft of legislation which places limits upon it. One such limit is that your total pension contributions, including employer contributions, must be kept within an annual allowance to avoid tax charges. For 2018/19 and 2019/20, the basic annual allowance is £40,000, but it is gradually reduced if you are a high earner. As a very broad guide, phasing starts to bite if your income (not just earnings) plus your employer pension contributions exceed £150,000, and at £210,000 or more hits a £10,000 contribution floor. There are some special rules that may allow you to catch up on the pension contributions you could have made in the previous three tax years, and thus contribute more than one year’s annual allowance. This process is known as ‘carry forward’ and in 2018/19 you can exploit it to mop up your unused annual allowance dating back to 2015/16. 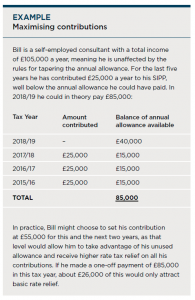 The rules are relatively complicated in their application, but, in theory at least, if your earnings are high enough and you have not paid into a pension in recent years, it would be possible to make up to £160,000 of pension contributions in 2018/19 with full tax relief. Alongside the annual allowance, there is an effective limit on the tax-efficient value of your overall pension benefits. If this is breached, then a tax rate of 55% could apply to the excess. The standard lifetime allowance is currently £1.03 million, rising to £1.055 million for 2019/20. That may sound more than enough, but at current annuity rates £1.03 million would only provide a 65-year-old with an RPI-inflation-proofed pension of about £2,700 a month (before tax). You may be entitled to a higher lifetime allowance, thanks to one or more of several sets of transitional rules. These have a labyrinthine complexity and advice is vital to maximise tax savings and avoid losing any entitlement. Expert advice is also essential if the lifetime allowance and/or annual allowance mean that you cannot build up an adequate pension fund for your retirement. There are many ways to create retirement funds outside of the pensions arena, some of which offer tax reliefs similar to those provided by pensions. The lifetime allowance was reduced to £1 million in April 2016, but protections may be available if your pensions savings were built up before the reduction. Whether or not you wish to maximise your pension contributions, it is well worth taking some trouble to decide how they should be made. If you are an employee, then you (and your employer) can save NICs. The secret is for you to reduce your salary or your bonus and ask your employer to use the money, including the NIC saving, to make the pension contributions for you. The technical name for this is salary or bonus sacrifice and it is all perfectly legal, provided you do it correctly. If you pay basic rate tax, the result could be an increase of nearly 34% in the amount being paid into your pension. If you are a higher rate taxpayer, the uplift is nearly 18%. Your ability to borrow money, for example for a mortgage. Your entitlement to redundancy payments or other benefits such as statutory maternity pay, working tax credit or child tax credit. Any life insurance or income protection where the amount paid is linked to your salary. Unless you only have defined benefit pension arrangements, your pension will require you to make and regularly review investment choices. All auto-enrolment pension arrangements and some other pension plans offer ‘default’ funds or investment strategies, designed to spare you the task of making investment decisions. The simplicity may appeal to new investors, who aren’t ready to make such investment decisions. You are still making an investment choice, which is to follow the decisions made by the manager of the default fund or strategy. By definition, the default option is not personalised to your particular For example, it takes no account of your other investments. There is no such thing as a standard default fund or strategy: a recent survey found one large pension provider holding 84% of its default fund in shares, while a competitor had just 44%. As an alternative to the default ‘choice’ you can actively take investment decisions designed to match your retirement goals. Many people who adopt this route rely upon their financial adviser either to make fund recommendations, manage the whole process or appoint a specialist external investment manager. You always have the option of DIY management, but in practice this requires time and expertise to avoid serious mistakes. A major advantage of the tailored approach is that it allows your pension investments to be integrated into your overall investment portfolio. Otherwise you could find yourself, for example, selling Japanese funds from your portfolio while your default investment manager buys into Japan. You can take a more tailored approach to integrate your pension investments with your portfolio, but without advice this can be risky and time-consuming. If you were to wait for a time when pension rules remain constant your retirement date would be likely to arrive first. Governments of all hues have regularly revised the tax and other rules surrounding pensions. Often the motivation has been to save money, either by reducing the tax relief cost (estimated at £38.6 billion in 2016/17) or by cutting expenditure on the state pension. Government changes to pension taxation have meant that, for some people, there is no longer any financial sense in making pension contributions, a reminder of how important reviews can be. For others, recent reforms have transformed pensions into a key estate planning tool. Your circumstances could For instance, you may want to alter your retirement date, use an inherited lump sum to make a one-off contribution or move to a new employer offering a different pension arrangement. If you have a defined contribution plan, the underlying investments will need to be reviewed in the light of market conditions and any changes in your Usually it is best to do this as part of an overall portfolio review. As you approach retirement your pensions will usually need to be recast as plans to provide income rather than build up This could mean a different investment strategy and/or in some cases a switch of pension provider. Given the frequency of government reforms to pensions, plus your own changing circumstances, regular reviews should be built into your financial planning. The value of your investment can go down as well as up and you may not get back the full amount you invested. Past performance is not a reliable indicator of future performance. Investment in a registered pension fund is subject to many restrictions on access on how the funds can be used.